An urgent message from the UK solar industry. Ten of thousands of jobs are at risk within the next few weeks. In 2007 David Cameron pledged his support for feed-in tariffs for renewable energy. On the 31st October 2011 his government slashed feed-in tariffs by 50%. This move threatens 4,000 businesses and 25,000 solar jobs in the UK. David, do you believe in green growth or not? 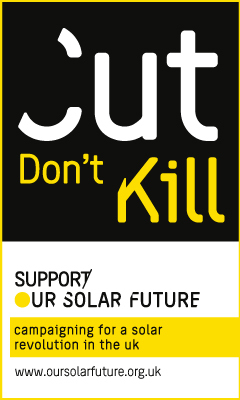 ‘Cut, don’t kill solar’, support our solar future. The development of solar power in the UK is under threat. The Government is intending to introduce crippling cuts to the Feed-in Tariff – a move that would kill the industry and destroy thousands of jobs. We need your help. We need to make sure that the Government know about the success of the industry and the consequences of cuts this size, and we need you to help us tell them. There are 4,000 solar businesses across the UK employing 25,000 people. Solar costs a fraction of the amount currently being spent on other energy generation technologies. Feed-in tariffs add less than £1 per year to the average household bill at a time when the Big 6 energy companies are imposing huge increases on their customers. It also provides energy security, new green jobs and lower energy prices in the long-term. Feed-in tariffs – the mechanism designed to support solar PV in the UK – have worked. The industry is thriving. As it grows and costs go down, we agree that there should be a gradual reduction in the tariffs. But the Government want to dramatically cut them – a decision that would have catastrophic consequences for the industry and our green future. Our Solar Future in the UK is at stake. Together we need to let the politicians know we want a solar revolution in the UK – and we need your help to do this. Download our templates letters and press releases. Let your MP know that our solar future is at stake. Make sure they cut, don’t kill our solar future. Here is a selection of banners you can place on your website to link to Our Solar Future. You can copy and paste the HTML in the text boxes below directly into your webpage to make the banners work.